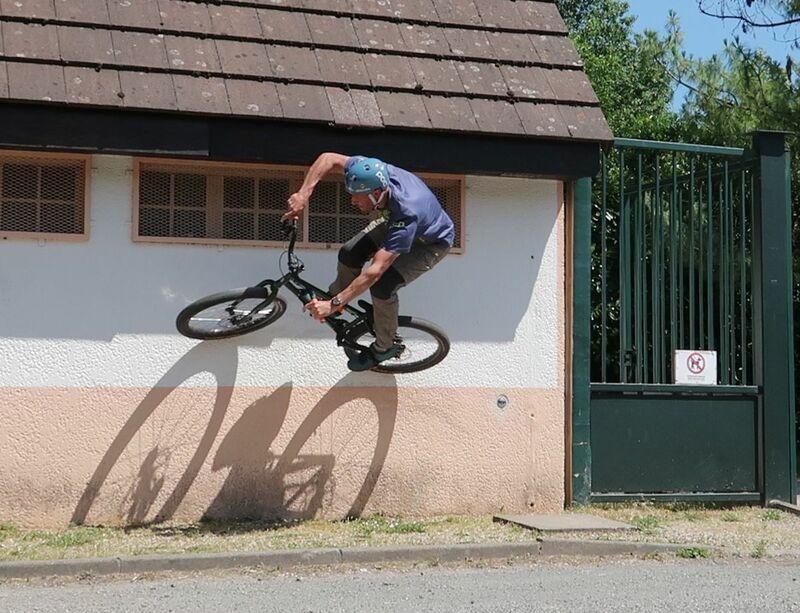 More commonly seen on the BMX or free-ride scene, wall rides are about following an odd path on very slanted or vertical walls, trying to get transient grip outside the regular gravity framework. Even on large steep rocks, performing a wall ride will optimize your grip transversally for a quick ride, up an obstacle that would be too steep if you tried with a frontal approach. A curved wall ride can also boost your speed on a short run-up distance. 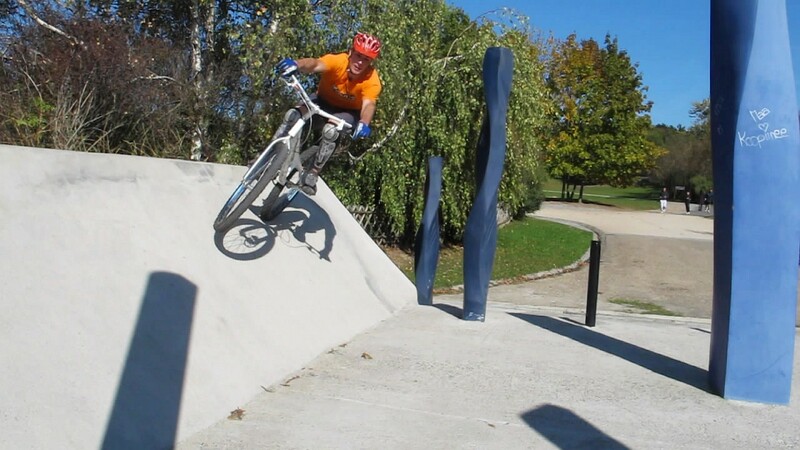 Learn this on a slanted wall, something that lets you ride up progressively, before you try onto steeper walls. Tilt the bike to get those tyres rolling. Approach the wall at a good pace, at an angle of about 45° to its base. The farther and higher you want to ride while cheating gravity, the more momentum you need hence the faster you must go. This is where the higher gear ratio of street bikes or BMXs come in handy. Your momentum will help you build pressure against the wall and increase tyre friction. 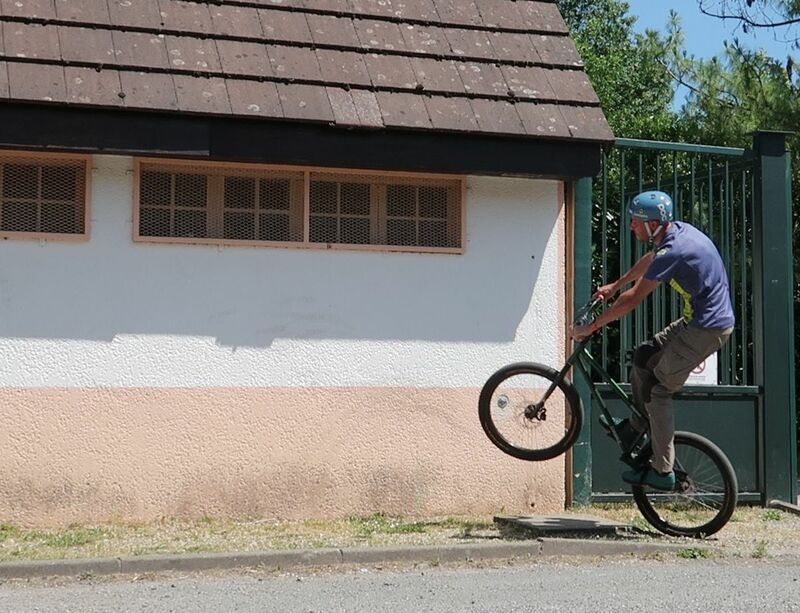 If the wall is too steep to ride up progressively from its base, launch a bunny hop or a pedal up to land directly with both wheels on the wall. Just before you land, tilt the bike sideways and force the tyres to roll as perpendicular as possible to the surface when they touch down. Let the brakes loose and start crouching progressively as you roll higher and slower. Ideally, you should follow an imaginary parabolic curve, and crouch further against the bike to maintain pressure and grip on the slanted or vertical surface. 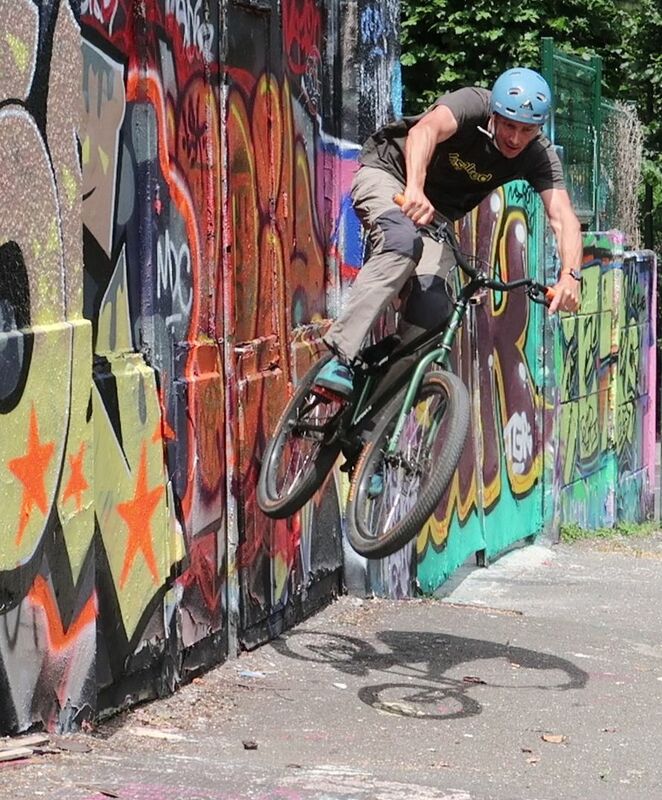 You have reached the highest point of the wall ride when you can no longer crouch to maintain artificial grip through your horizontal momentum. 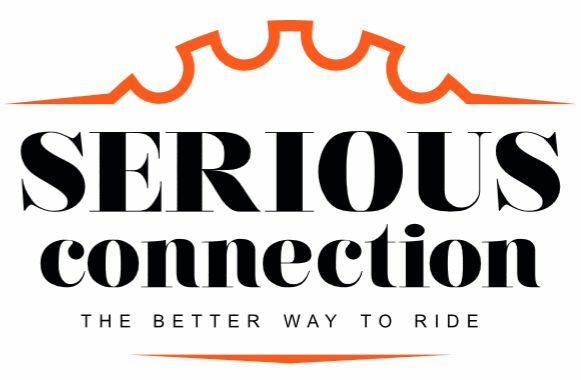 From the highest point in the wall ride, or on your way down, extend your arms and legs progressively from your crouching position to maintain pressure and grip. 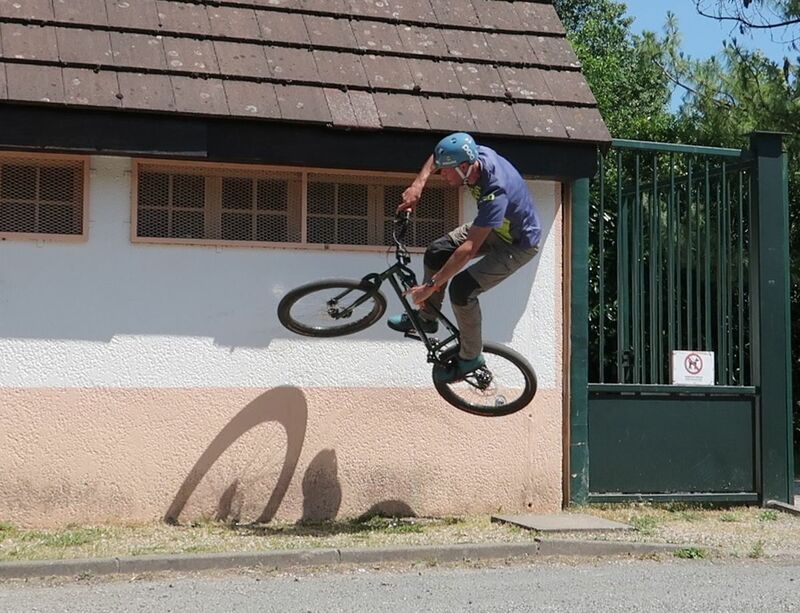 If the wall is too steep to simply ride down to the ground, spring back into a full jump, pulling on the bars to take-off the front wheel and eject yourself off the wall (like in a bunny hop). You can boost your exit and add more control to the move by pedalling off the wall as in a wheelie drop. As soon as the rear wheel loses touch, re-adjust the tilt of the bike to the vertical and re-align the bike beneath you to face the ground and land clean. 1° Approach the wall at a good pace, at an angle of about 45° to its base. Your momentum will help you build pressure and friction. 2° Launch a bunny hop and tilt the bike on its side to position the tyres as perpendicular as possible to the surface as you touch-down. 3° Leave the brakes loose and start crouching progressively as you roll higher and slower to maintain pressure and grip on the slanted surface. 4° From the highest point in the wall ride, or on your way down, extend your arms and legs progressively from your crouching position. 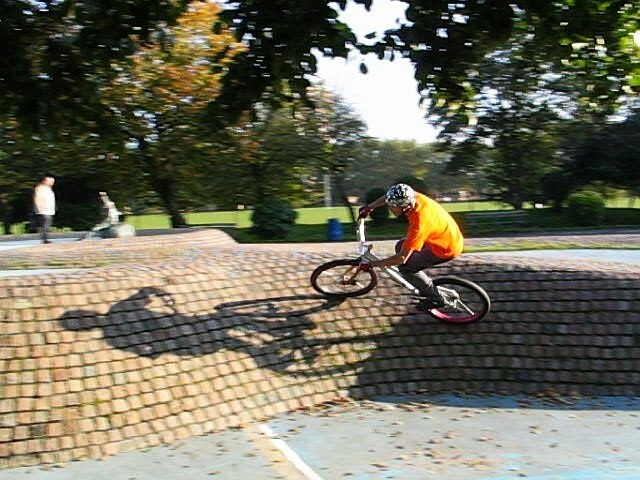 5° If the wall is too steep to simply ride down to the ground, spring back into a full jump, pulling on the bars to take-off the front wheel. 6° As soon as the rear wheel loses touch, re-adjust the tilt of the bike to the vertical and re-align the bike beneath you to face the ground. 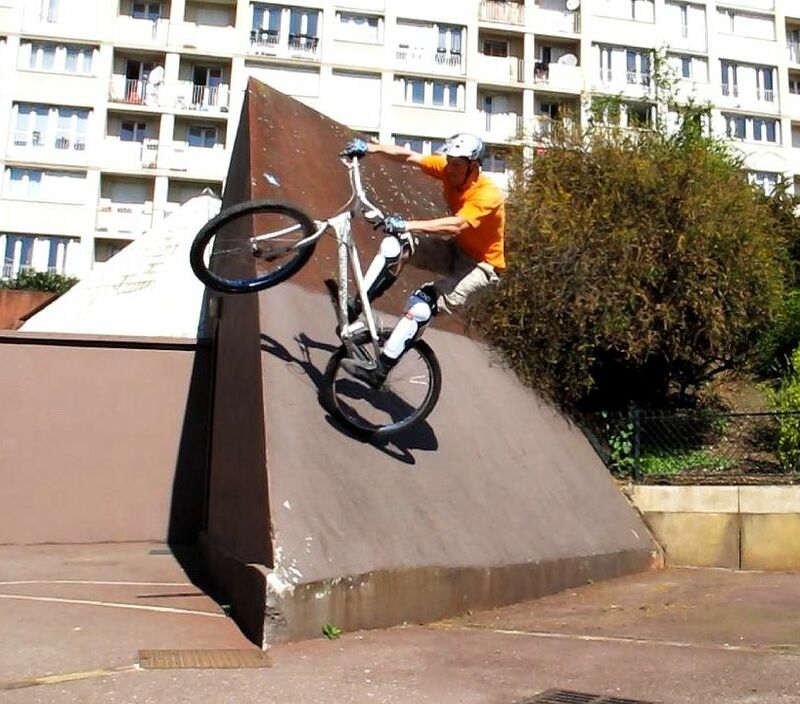 Exiting a wall ride into manual. Try to visualize your path as a curve on the wall, as if you were riding up a curved BMX track with a high lip. You must build enough momentum towards the wall to feel like you would fall against it if it weren't there to support the ride. By combining this momentum with the tilt of the bike, it nearly feels as if gravity were no longer pulling you vertically, but sideways. To use that effect and maintain your grip on a slanted surface, focus on being supple and absorb the pressure progressively. Don't stand too rigidly as you land on the wall, this would eliminate completely any momentum towards the wall, your only hope for a decent grip (tyre friction). When you reach the highest point of the wall ride (that's when the bike stops going up and starts loosing grip, you'll know it), keep the pressure in your legs in order to stick your tyres onto the slope and roll smoothly. As long as you'll be pushing your tyres against the wall, you'll secure enough grip to ride and control your bike. In any free jump, you would follow a natural parabolic curve (that's gravity law). When you are riding on a wall after a bunny hop, you are merely using tyre friction to assist your jump and cheat on gravity. But you are only "assisted" and the grip alone is too weak for you to stay up there. So to make the transition as smooth as possible, follow the nearest path to what would be a non-assisted jump: that natural parabolic curve. Without securing some grip with your tyres, you won't be able to roll and control the curved path. Gravity will simply drag you down too quickly and crash you to earth before you get a chance to ride along. 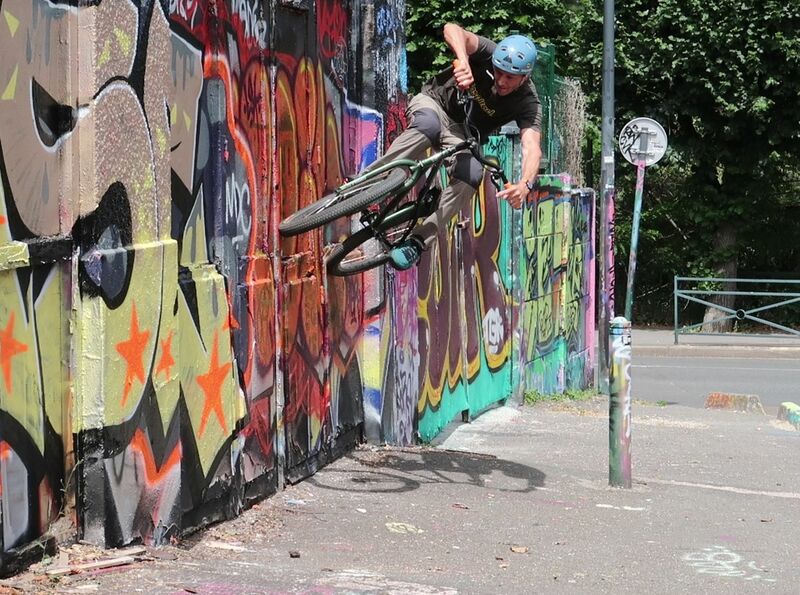 Some wall rides require full control over the rear wheel. Depending on the texture and grip of the wall, you will be able to cheat a bit, but turn down and push back into extension again as soon as you lose grip. When you exit the wall ride, pull on the bars and tilt the bike vertical or to the best standing position you can. 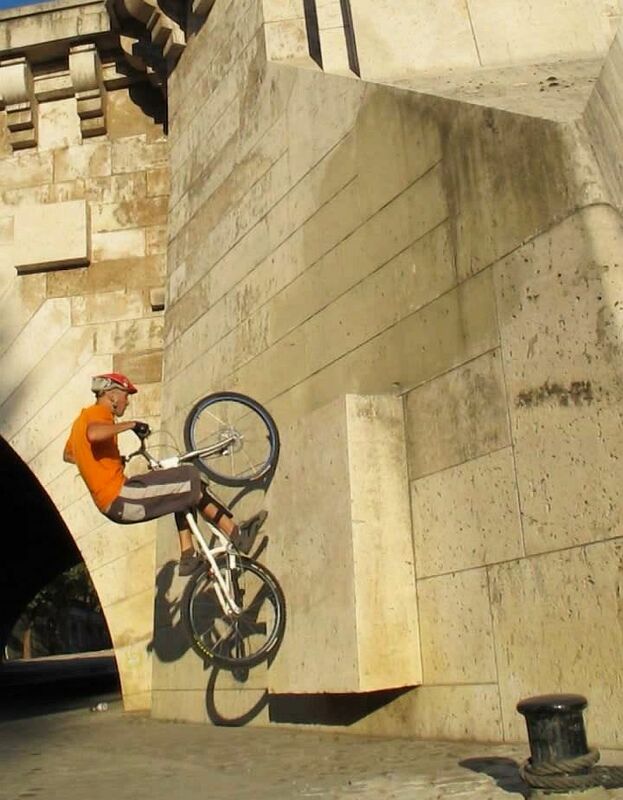 As you leave the wall ride, gravity comes back in full control and you should land properly. If you lose grip too early or try to leave the wall too late, you may end up either scratching your elbows or falling flat on your side. No exit except a controlled back-hop. 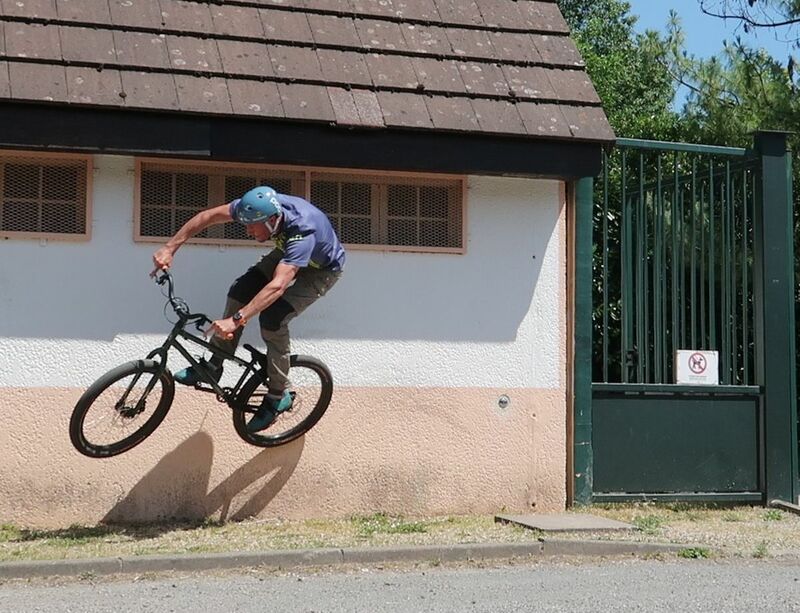 Tilt up the bike as you exit the wall ride. Vertical wall rides are the trickiest. You must tilt the bike nearly horizontally to bring your tyres properly into contact with the wall and ride up. Practise your bunny hops with that in mind. If you approach too frontally and you slam your wheels too vertically, you won't be able to ride a curve either. In that case, either twist back off the wall and avoid a crash on your back, or eject yourself and try to land on your feet. If you can't tilt the bike enough, your tyres will slip off the wall right down to the ground and you may just bruise your elbow or shoulder against the wall. 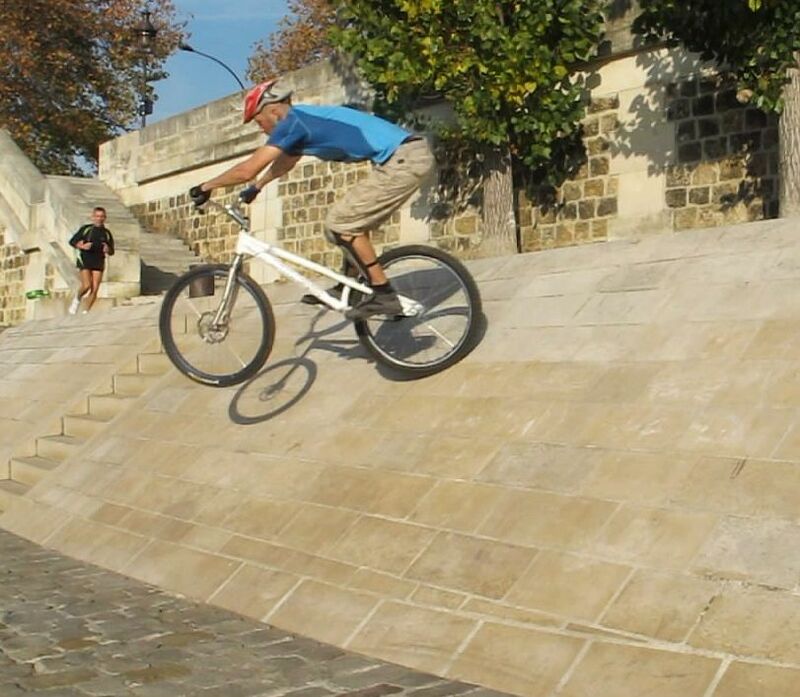 1° Riding at about 45° from its base, launch a bunny hop to get up to the vertical part of the wall, a bump boost will help. 2° Before touch-down, tilt the bike on its side to position the tyres as perpendicular as possible to the vertical surface. 3° Follow a natural parabolic curve and try to stay smooth on your legs to maintain as much grip and direction control. 4° Spring back into a full jump, pulling on the bars to take-off the front wheel as you exit the wall. Once you manage a slanted bunny hop, use the same progressive grip-in, grip-out approach as described above. Remember, no grip = no ride. With their higher gear ratios, free riders and dirt jumpers can go much faster and often use a small ramp or bump to launch a massive jump. This leaves them enough air-time to position the bike correctly and perform impressive wall rides. A large curve will boost your grip and speed. If the wall is curved, riding inside the curve will boost your grip too. Once you understand the tricks that keep your tyres well stuck onto very steep slopes, you'll be able to ride up slanted rocks until you reach a more horizontal spot or some edge onto which to hook your front wheel. It will also help you for rolling up big obstacle. Your limiting factor for most wall rides is the speed and angle at which you can approach the obstacle, depending largely on available run up distance and your gear ratio.